The full text of Dr Prabhat’s oration is now reproduced here as a token of the values that the University of Bristol Law School, as a community, strives to foster. A few months back, in April, a unique museum opened in Montgomery, Alabama. With it also opened a new American memorial. Both are about Black lives lost to racial violence in the United States. 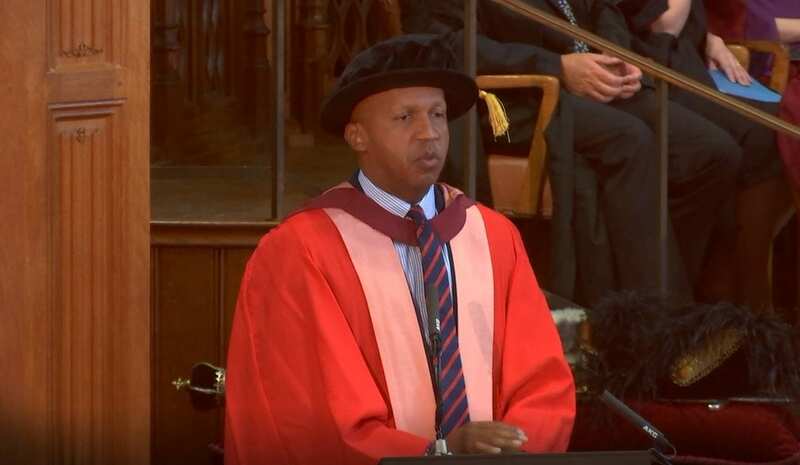 Both are the visions of today’s honorary graduand, Professor Bryan Stevenson, and his team at the organisation he founded: the Equal Justice Initiative. Why was there a need for a museum on enslavement and mass incarceration? Why did Bryan plan a national memorial in which victims of lynching are remembered? The answers can be found in Bryan Stevenson’s life in the law. He has spent more than three decades as a lawyer representing people on Death row. Yes, Death row. Many parts of the United States still execute people. Most of these people are Black and poor. Today, one in three African American men are incarcerated at some point in their lives. In America’s prisons and execution sites, Bryan saw the continuity of the very same racial violence that was there in slavery and in lynching of Black people. Yet, acknowledgement of racism, or race, in American society is extremely rare. The museum and the memorial are a lawyer’s attempt to educate society about the injustice he saw daily in his legal practice. Today, we know that Bryan’s work has changed the American legal landscape. He has won cases for over 125 wrongly condemned prisoners on death row. His work has led to the US Supreme Court putting to an end mandatory prison sentences for life (without parole) for children 17 years old or younger. In October this year he is again challenging the right of the state to kill any person as a form of punishment. This is in a case before the Supreme Court where a man has no rational understanding of the crime for which he has been convicted. Bryan’s phenomenal work does not surprise me. He is a law professor at New York University School of Law. I was a student there and I often heard Bryan discuss his work with rousing passion. He is a powerhouse of knowledge and unrelenting hard work. No barrier could hold him back from seeking justice. Yet, would you believe it, some thirty odd years back, Bryan was feeling a bit lost as a law student in Harvard Law School. Ladies and gentlemen, some of our own students may feel similarly lost today. Many law school subjects seemed remote from Bryan’s life because he had grown up poor in the racially segregated South. All this changed when Bryan volunteered in Atlanta with the Southern Prisoners Defense Committee. As a young law student he worked with poor Black people on death row and this galvanised him. He powered his way through law school. Today, I am sure it is not his numerous awards and accolades that motivate Bryan. He is fuelled by the love of the people he serves. One such person once told him that he was beating the drums of justice and Bryan has continued to do just that over the years. Not with only anger and outrage. But with high quality legal work meticulously supported by evidence. It is this style that also permeates his work out of court. Which brings me back to the newly opened National Memorial for Peace and Justice. The memorial has 800 columns. Each column represents a county where documented lynchings took place. On each column is engraved the names of victims. Each column is about 6 feet tall and bolted to a thick metal post anchored not to the floor but to the ceiling. When it rains, it appears the reddish-brown columns bleed rivulets of blood. This memorial exemplifies Bryan’s work. It is built on the back of research on each reported instance of lynching in the South. Bryan and his colleagues discovered nearly 800 more lynchings which had not even been reported during this research. They also documented 300 lynchings in other states during the same time period. In his New York Times bestseller book titled Just Mercy Bryan notes that people are broken by prisons and the criminal justice system just as their lives were destroyed by lynching. Racial inequality and abject poverty go hand in hand with the lack of dignified treatment before the law. Most people in prisons have never received any compassion. Yet, many of Bryan’s clients on death row have great compassion for those who had put them on death row, and even for those who continue to mistreat them there. This is what compels Bryan to call for ‘just mercy’: a mercy that goes beyond mere calculations of innocence and guilt and of crime and punishment. Bryan is already recognised worldwide with numerous awards and accolades. He has received 33 honorary degrees including degrees from Harvard, Yale, Princeton and Oxford. We, at the University of Bristol Law School, have another honorary degree to add to his list today. But this merely provides us the occasion that brings him here. What we truly seek is inspiration for our own lives in the law, particularly that of our students, many of whom are still searching for their own destinies in the field of law. Ladies and Gentlemen, I put to you that no one can inspire us better to beat the drums of justice. 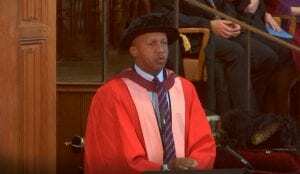 Pro Vice-Chancellor, I present to you Bryan A Stevenson, as eminently worthy of the degree of Doctor of Laws, honoris causa.